After five years of fighting, there is still not much hope that the crisis in Syria will end soon. It does not only affect the economy, Syria’s social life and the country’s education, but also creates an omnipresent sense of danger and insecurity that influences all aspects of life. Nevertheless, some areas and fields of profession are more threatened than others. For instance, scholars either under employment or as professors are prime targets, because they are working with official institutions which are considered traitors and infidels by radical Islamic groups such as Isil or Al-Nusra. Scholars are in imminent danger which is why many baptized academics are forced to leave Syria and immigrate to safer countries like Germany. However, once arrived in Germany, new challenges arise. The different labor standards and especially the language barrier constantly proof to be a hurdle as a majority of immigrated Syrian academics do not speak German. Additionally, finding suitable work proves to be very difficult due to the specialized labor market. Here it must be pointed out that some specialized professions can be seen as opportunities for Syrian academics. The medical field in Germany for example has recently experienced an increased need for qualified employees. Therefore, highly trained and talented Syrian Doctors might be able to fill a gap in this area. Besides the medical field, informatics offer promising opportunities for academic refugees as the demand in the German computer science market is still not covered. In conclusion, it can be noted that professions in need of specialized and highly qualified experts offer many opportunities for Syrian academics. But these cases are very rare due to the limited amount of experts. Moreover, universities and institutions who ask for scholars in humanities, law, education and other fields, offer only a limited amount of positions. And even if positions are vacant, the Syrian candidates must fulfill the demands of the position, which is very difficult for Syrian academics who have followed a different system. These Syrian scholars are in a difficult situation and spend a long time preparing the application and waiting for the results which, in most cases, are negative. Of course, this will force them to search for work in areas which are completely different from their initial profession and their specialties. Thus, many Syrian academics slowly abandon the field they were trained in. Regarding myself, I had to leave Syria when it became impossible to continue, especially when I could not reach my apartment in the suburb of Damascus anymore. My family and I were forced to move to a safer place and thus I had to travel about 700 kilometres every week between my family and Damascus University in Sweeda. The road to Damascus was extremely dangerous and the threat of radical groups was immense and impossible to avoid. Thanks to an earlier cooperation with Konstanz University, an opportunity for rescue arose. The university helped me by granting a 15 months work offer to participate in the preparation of archaeological exhibitions in the center of the town. In addition, I became a member of the teaching staff at the university, where I was kindly supported by Professor Hauser who was very helpful and encouraging in this period. But after the contract had ended and I had to apply for other projects in other institutions and universities, it became very difficult to attain a new position. Opportunities were limited according to the few positions available and due to my specialization in the Near East and in Syria in particular. What is more, it was not easy to integrate into the German system for various reasons regarding the System itself, but also because of my knowledge of the German language. In this respect we must also confirm some suppositions. Firstly, not all scholars who come to Germany fulfill the required scientific attitude and sometimes are not able to cope with the existing scientific situation and realities in Germany. Secondly, German institutions are organized in a way that they hire scholars at an early stage in their career to bind them to their institution for as long as possible. Thus, it may prove difficult to join such projects in late phases for Syrian scholars. Thirdly, in the last decades, the German university system has developed and became a more precise and more specialized in order to meet its goals. In Syria on the other hand, these developments did not take place, especially in humanities, which explains the discrepancy between the German and the Syrian structures. As I mentioned above, due to the fact that this exceptional situation in Syria has been continuing for five years and has affected all aspects of life in Syria, the educational system has broken down completely in some provinces such as in Idleb and Raqqa. Both provinces are controlled by the radical groups Isil and Al Nusra. These groups did not allow any continuation of any teaching, neither at school nor at university. Moreover, the educational guidelines were substituted for a new Islamic system that only teaches the radical principles of the groups’ ideologies. Nevertheless, the majority of provinces in Syria manage to continue their education on an almost regular level, yet they face difficult conditions given the lack of security. Especially transportation from the countryside to cities like Damascus, Homs, Hama and Aleppo proves to be a major obstacle for scholars and students alike. Of course the pressure is enormous and some scholars cannot attend their lectures because the routes to their schools or universities are not safe anymore, since constant danger is caused through clashes between the Syrian army and Isil or other radical groups. In other words, the education process continues while the government tries to provide the required resources, but until now the success has been limited. At Damascus University, the education system still works and professors and students who live inside the city or in the safe parts of the countryside are able to attend university. As a result of the embargo on Syria, there is a lack of resources. For example, most of the activities and excavations that used to take place at or were organised by the Archaeology department were cancelled. In turn, the foreign Archaeological Institution in Damascus was closed as well, which further influenced the educational system since the institute used to offer help and support with its libraries and activities. So, in desperate need for support and other resources, archaeology as a science finds itself in a difficult situation. Apart from the economic crisis and the high costs for transportation, students and professors are generally under a lot of pressure being one of the main difficulties that the educational system experiences at the moment. What was described above is not necessarily the case for all universities in Syria. In safer regions like Latakia, Tartus and Hama, the educational process is carried out in a more reasonable manner. In safer areas most demands can be met and most of the professors prefer to move to those universities located in safe areas, where an acceptable place for their scientific work and research is provided. And if scholars decide to move to another university such as Aleppo, the attempt will be very frustrating and dangerous as universities are caught between the ministry of high education, which tries to keep the system of education intact, and radical Islamic groups, who attack the universities in order to disintegrate the system completely. A similar case can be witnessed in Daraa where the Syrian army clashed with radical groups. After losing most parts of the province to Al-Nusra, it became too dangerous for students and teaching staff to attend university. The University of Damascus supported Daraa by hosting their students in the partner University in Sweeda. In spite of this helpful measure, it was not easy for the students in Daraa to reach Sweeda because of the dangerous roads connecting the cities. Thus, most of the students and professors were forced to move to Damascus and continue to travel to Sweeda and settle there during terms. 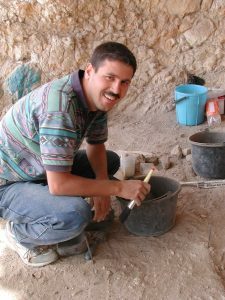 Ammar Abdulrahman studierte Alte Geschichte und Archäologie an der Universität Damaskus und promovierte 2006. Er war seit 2008 Direktor des al-Basil Center for Archaeological Research and Training der Generaldirektion des syrischen Antikendienstes. Seit 2013 leitete Abdulrahman das Department für Archäologie der Universität Damaskus. Nachdem die Situation in Damaskus zu gefährlich wurde, kam er mit seiner Familie nach Deutschland und übernahm 2014/2015 die Vertretungsprofessur für Archäologie der altmediterranen Kulturen und ihrer Beziehungen zur vorderasiatisch-ägyptischen Welt an der Universität Konstanz. Er ist Mitglied der Arab-German Young Academy of Sciences and Humanities (AGYA) der Berlin-Brandenburgischen Akademie der Wissenschaften.